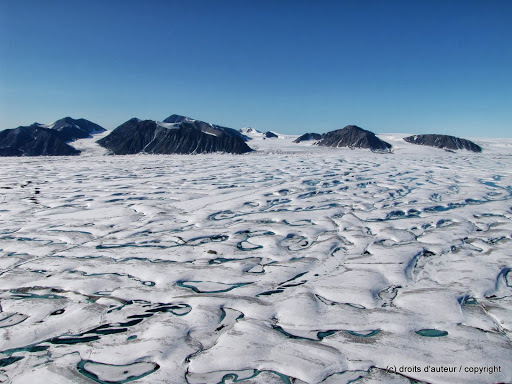 Ward Hunt Island is located at the northernmost tip of Canada, off the coast of northern Ellesmere Island and is part of Quttinirpaaq National Park, Nunavut, Canada. 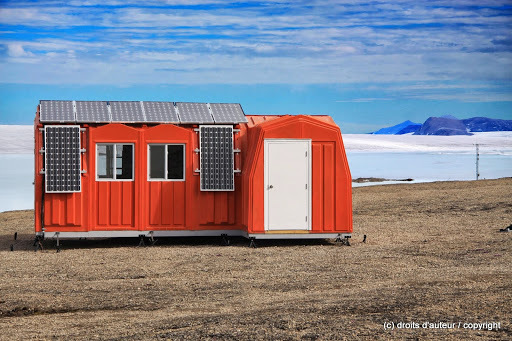 Quttinirpaaq means “top of the world” in Inuktitut and reflects this station’s location, situated about 750 km from the North Pole. This High Arctic island is 6.5 km long (from east to west) and 3.3 km wide. 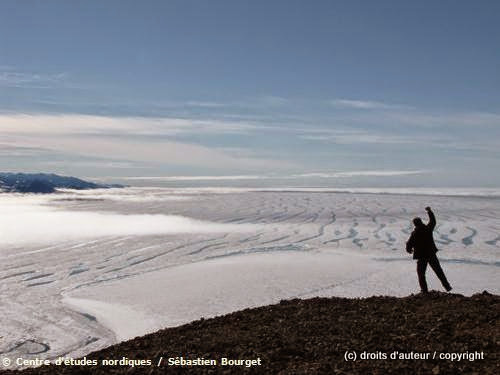 The climate regime is typical of polar deserts, with dry and extremely cold temperatures (annual mean temperature of -17.3°C). The natural environment features lakes, ice shelves, fjords, epishelf lakes, ice caps and glaciers, sea ice, mountains, and valleys. 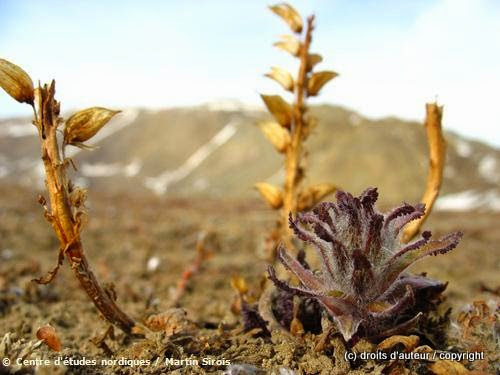 The desert terrain has a low plant and animal diversity, but the region contains diverse microbial communities such as cyanobacterial mats that survive in these extreme environments. No communities live on Ward Hunt Island. 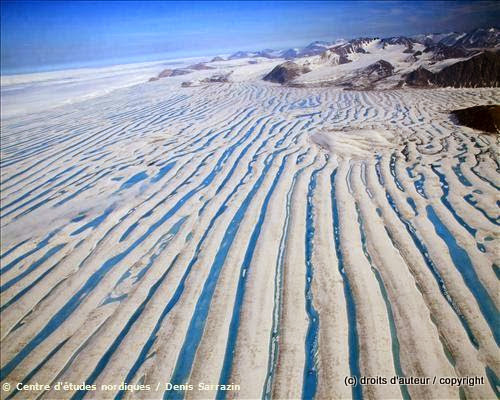 The nearest community is Grise Fjord, located 800 km away on southern Ellesmere Island. 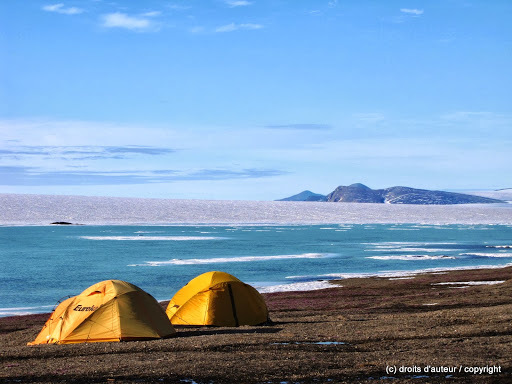 Grise Fjord or Aujuittuq (the place that never thaws) is a small Inuit hamlet in the Qikiqtaaluk Region in the territory of Nunavut, Canada. 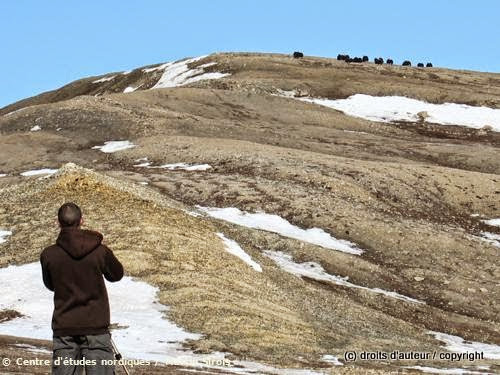 With a population of 141 residents (as of the Canada 2006 Census), it is the only Inuit community on Ellesmere Island. 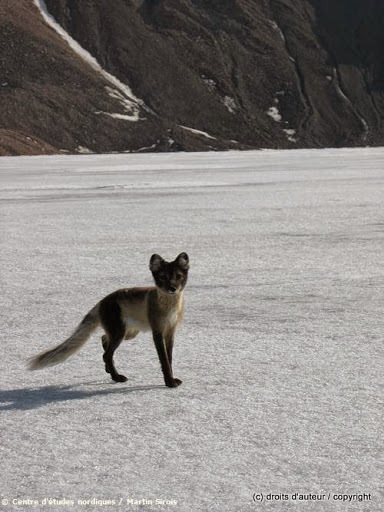 It is also one of the coldest inhabited places in the world, with an average yearly temperature of -16.5°C. 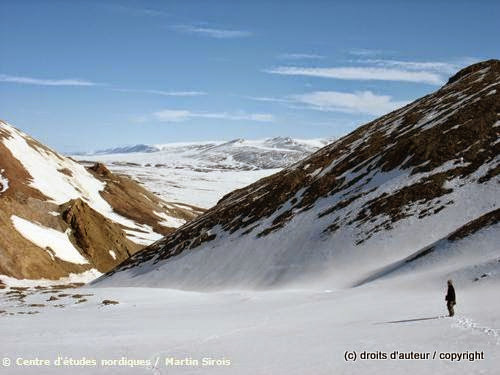 Grise Fjord lies 1,160 km (720 mi) north of the Arctic Circle in the Arctic Cordillera mountain range which is the only major mountain system east of the Canadian Rockies. The Canadian military base Alert is 170 km to the East and slightly to the South of Ward Hunt Island. Disciplines: Atmospheric chemistry, isotopic chemistry, climatology, climate change, environmental science, pollution, geology and sedimentology, glaciology, geocryology, geomorphology, soil science, gis mapping, hydrology, terrestrial biology, paleolimnology, paleoecology, limnology. 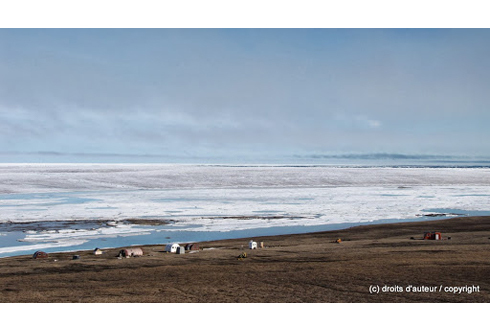 The main research topics include the structure and functioning of lake and river ecosystems at high latitudes, dynamics of northern ice shelves, microbial ecology, geomorphology of polar desert landscapes, impacts of UV radiation, and climate change on aquatic ecosystems. An overview of past studies in this region is given in Vincent, W.F., et al. (2011) Ecoscience 18: 236-261. 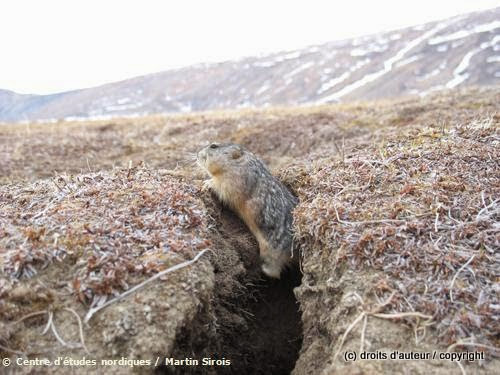 The site is located within Quttinirpaaq National Park. Hence, all persons going to the site must first contact Parks Canada. For information on access and permits, contact Quttinirpaaq Park Manager (http://www.pc.gc.ca/pn-np/nu/quttinirpaaq/plan.aspx) and the Polar Continental Shelf Program (PCSP; http://www.nrcan.gc.ca/earth-sciences/products-services/polar-shelf-services/11617) for appropriate application forms to access the site via chartered flights. 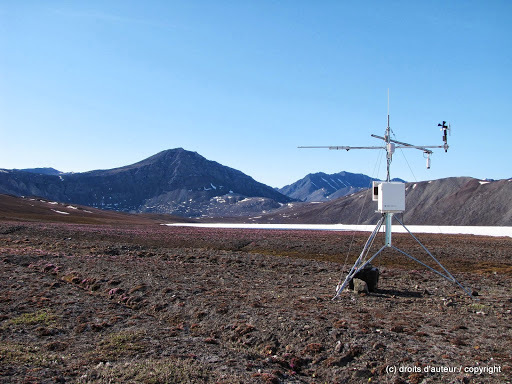 CEN has collected extensive climate data since 1995 and still operates a climate station from the CEN SILA Network (www.cen.ulaval.ca/sila) in the area. For requests concerning ecological monitoring data, please contact the lead researcher, Warwick Vincent. 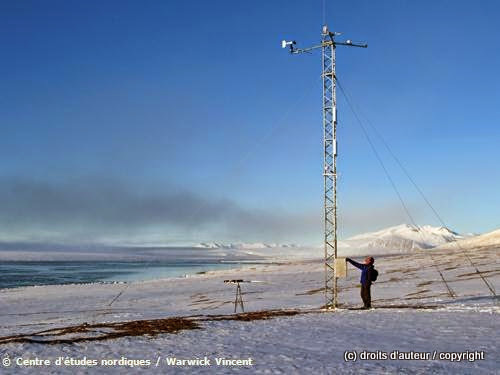 CEN's Nordicana-D series freely and openly give access to online climatic and environmental data reports archived at CEN, aiding the management of the wealth of environmental data sets produced by CEN's monitoring and research activities. The following data series is available for this area : CEN 2013. 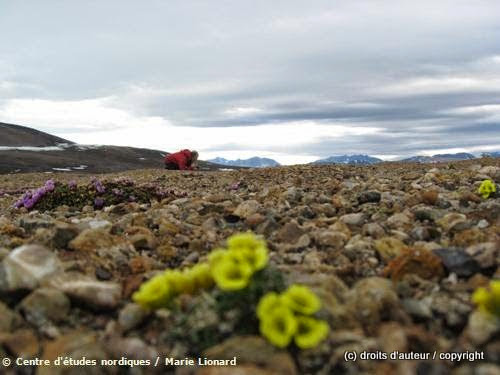 Environmental data from Northern Ellesmere Island in Nunavut, Canada, v. 1.0 (2002-2012). Nordicana D1, doi: 10.5885/44985SL-8F203FD3ACCD4138. Visit the Website www.cen.ulaval.ca/nordicanad/ to view the complete list of available data. The first known sighting of the island was in 1876 by Pelham Aldrich, a lieutenant with the George Nares expedition. The Island was named for George Ward Hunt, First Lord of the Admiralty (1874-1877). 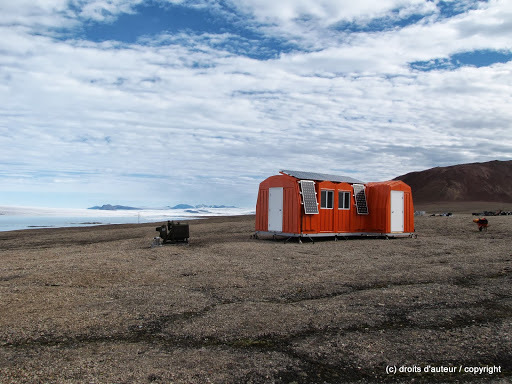 Ward Hunt Island was briefly used as a weather station during the International Geophysical Year of 1957-58, and since then it has been used as the starting point for a number of attempts to reach the North Pole, beginning with Ralph Plaisted in 1968. Scientists have been working at the station since the 1950s. Nowadays, Parks Canada has three Weatherhaven shelters onsite with oil burning furnaces. 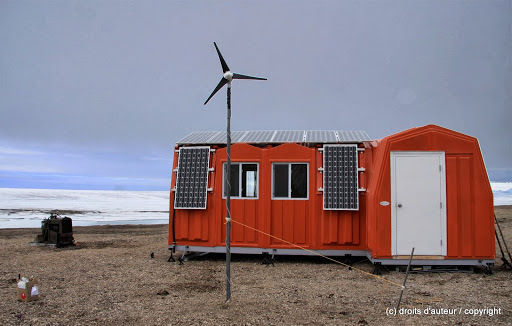 A laboratory made of insulated fiberglass and powered by solar panels was built in 2010, by CEN, thanks to a federal infrastructure grant. Total area: The total available area is 50 m2 including 25 m2 for scientific laboratories and 25 m2 for logistics. Number of rooms (beds): A total of 3 rooms (8 beds) are available. Shelters include 1 living area, 1 kitchen, 1 laboratory. No staff member is present at the station. Capacity: 8 to 9 visitors at the time. There are no showers nor laundry facilities at the station. Power supply is solar with generator on site. 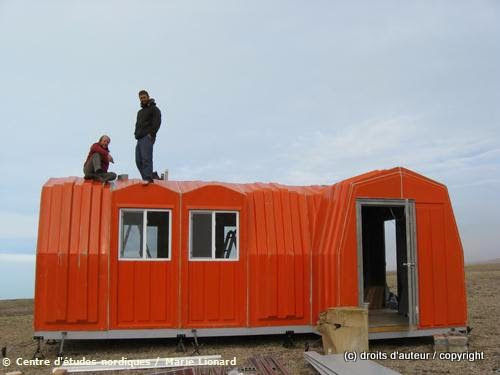 Shelters are heated by oil and propane. Waste must be sorted and evacuated. Satellite phones and VHF are available for rent for CEN members. Some basic laboratory equipment is available (microscope/binocular, glassware). WHMIS training or equivalent is required to use the labs. Chemical storage is not authorized. All products must be brought back after use. Helicopter time and snowmobile can be obtained through PCSP. No ATV can be used on site. Motorboat and Zodiak are present on site. Arrangements for fuel can be made through PCSP. Given that this is an extremely isolated station in a national park, all research activities must be planned and proposed at least one year in advance. Helicopter time can be obtained through PCSP. Gravel airstrip of 300 × 40 m (length × width). Lake landing available. Water landing is available. Helicopter lands on level ground. There are no ship docking facilities (landing wharf and pier). Safety equipment recommended to conduct field research on Ward Hunt Island are : pepper spray, scaring pistol, communication device, first aid kit, weapon (recommended). A high degree of self-sufficiency is expected. It is the responsibility of the user of the station to ensure that he or she has the necessary insurance to complete his or her research. The CSST provides insurance coverage to employees or student employees only for accidents at work. In all other cases, personal insurance must cover victims for accidents and evacuation. It is therefore essential to have adequate coverage in terms of activity and destination. Quebec Health insurance coverage is not valid outside of the province of Quebec. Agreements exist with some provinces, however, no agreement exists with the Northwest Territories or Nunavut, even if these areas are located in Canada. There are no medical facilities on the Island. Staff with basic medical training is found in Puvirnituq (45 min. airflight). Nearest medical facilities are in Iqaluit, Nunavut (2000 km airflight) and may take several hours. Transportation time depends on airborne services availability and weather conditions. The station is not equipped with compulsory safety equipment. The station is available to all researchers (university, college, governmental and private) working in the area. Early May to late August. 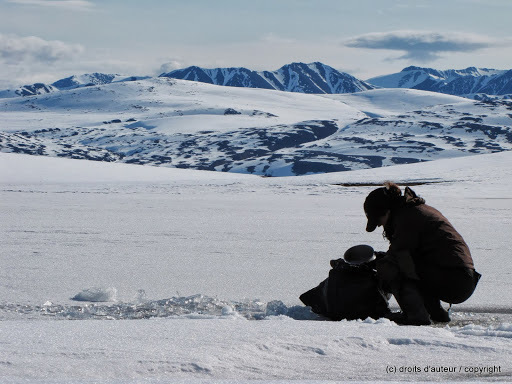 Contact the Quttinirpaaq National Park manager in advance to confirm opening and closing dates. No fixed cost. Cost to use facility must be negotiated with contacts in advance.